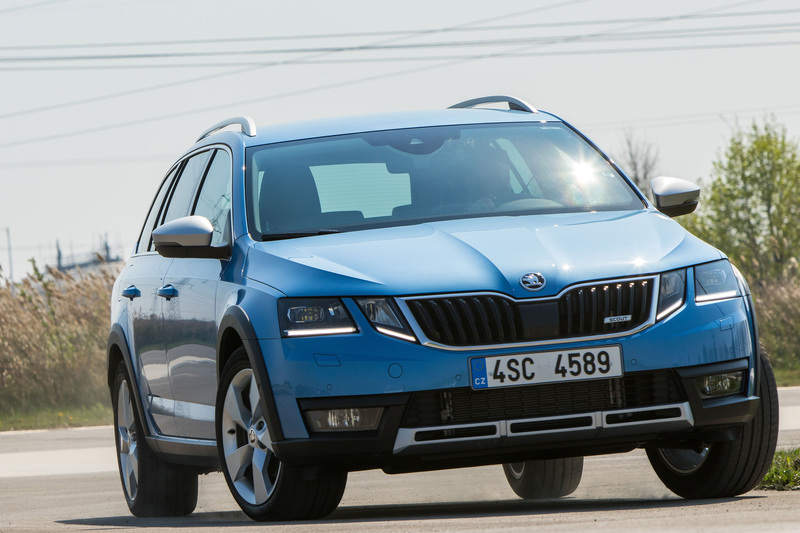 Mladá Boleslav / Pachfurth, 10 April 2017 – Silver-coloured underbody protection, protective side mouldings and black roof rails identify the ŠKODA OCTAVIA SCOUT as a robust all-rounder at first glance. 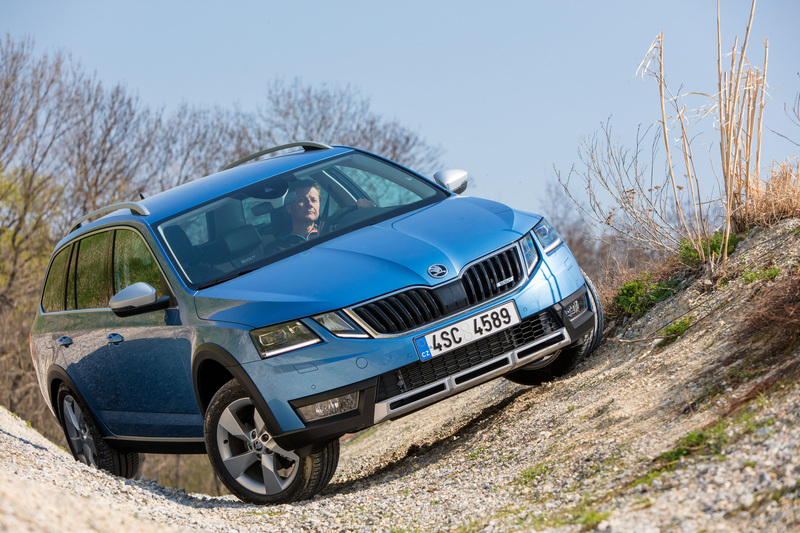 The latest all-wheel-drive technology, a departure angle that has been increased to 14.5 degrees and 30 mm more ground clearance also allow off-road trips. 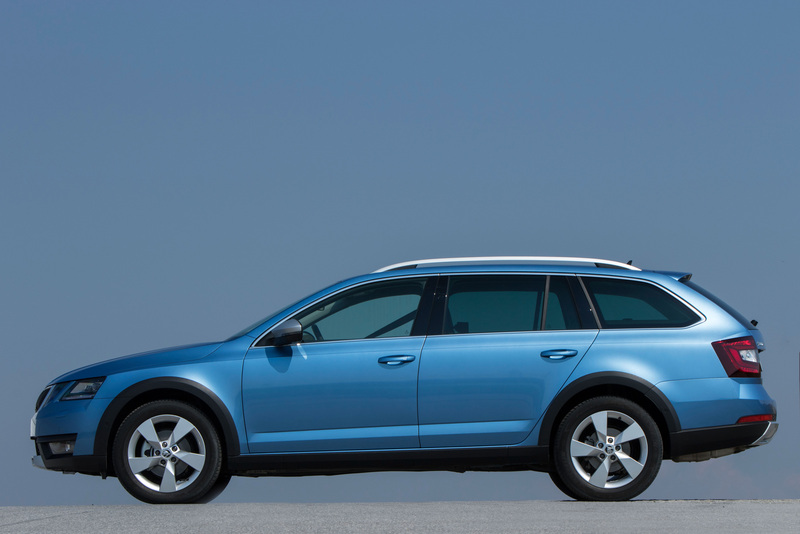 The many ‘Simply Clever’ features on offer contribute to the high level of practicality. There is a choice of three engines available – one petrol and two diesel engines with a power output ranging from 110 kW (150 PS) to 135 kW (184 PS). 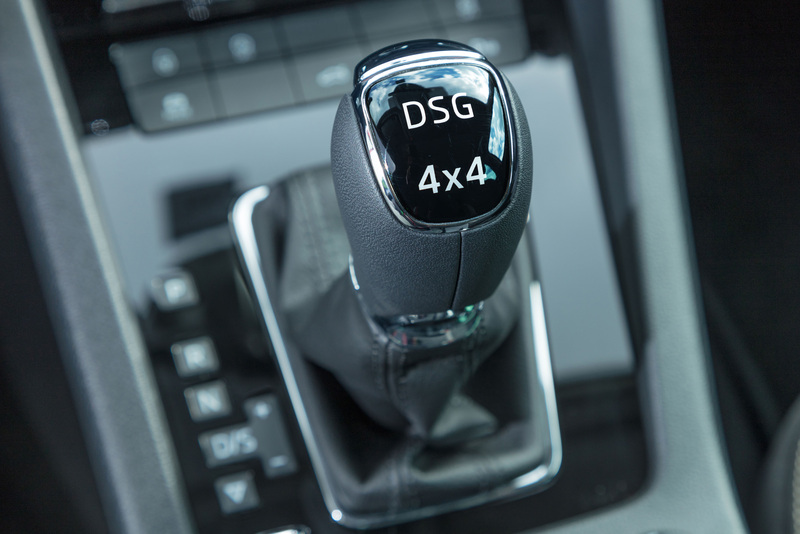 The two most powerful engines are coupled with a 6-speed dual-clutch transmission (DSG) as standard. 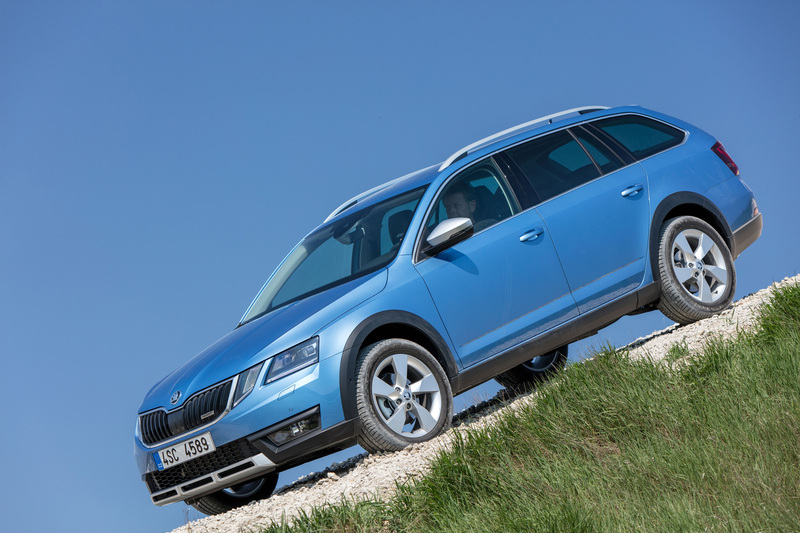 The all-rounder in the model range is based on the extensively revised ŠKODA OCTAVIA COMBI and is presented with a distinctive off-road appearance. Its unique character can be recognised at first glance by the silver-coloured underbody protection at the front and rear as well as by the protective side mouldings which are now body-coloured. 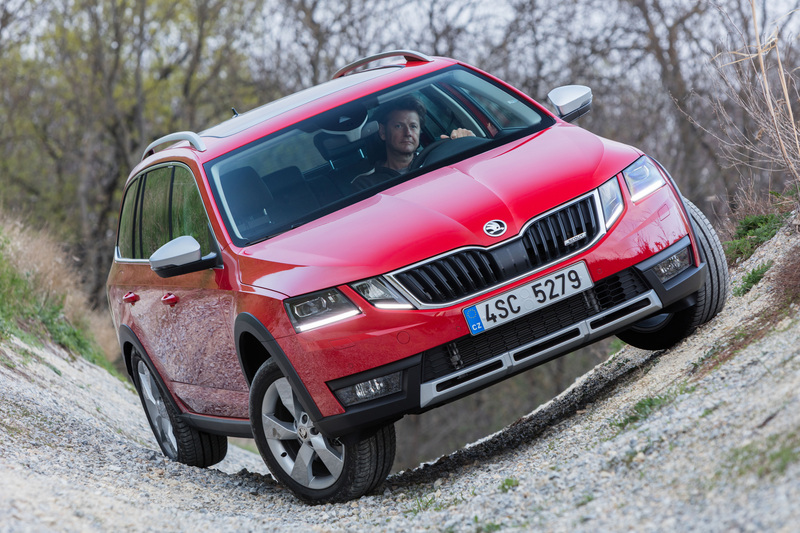 The Rough-Road package is also part of the standard equipment and features plastic coverings for the undercarriage as well as the brake and fuel lines. 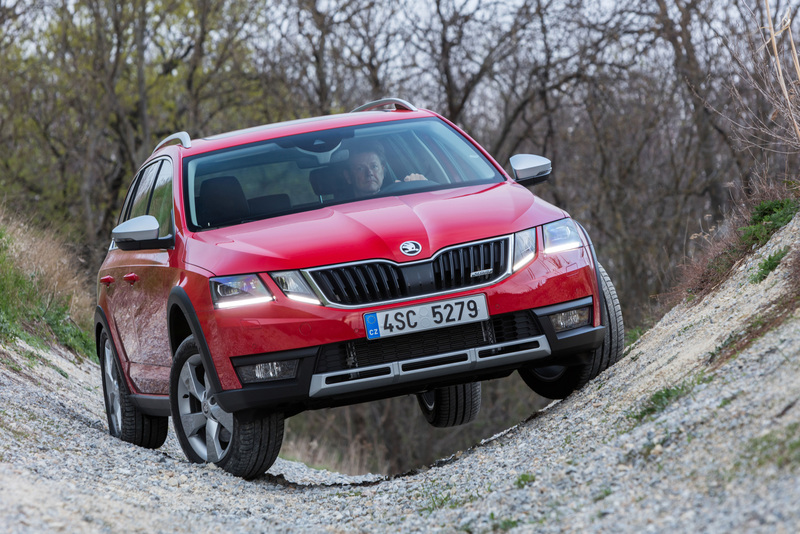 Other typical features include the Scout-design moulding on the bumpers, wheel arches and door sills, the aluminium-effect wing mirrors, the 17-inch alloy wheels and a wider rear track. 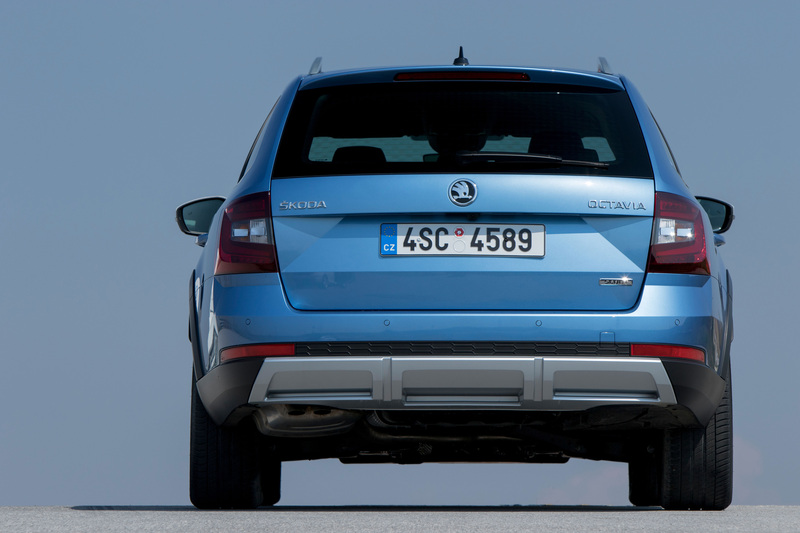 The ŠKODA OCTAVIA SCOUT is also equipped with the new front section for the successful model range. 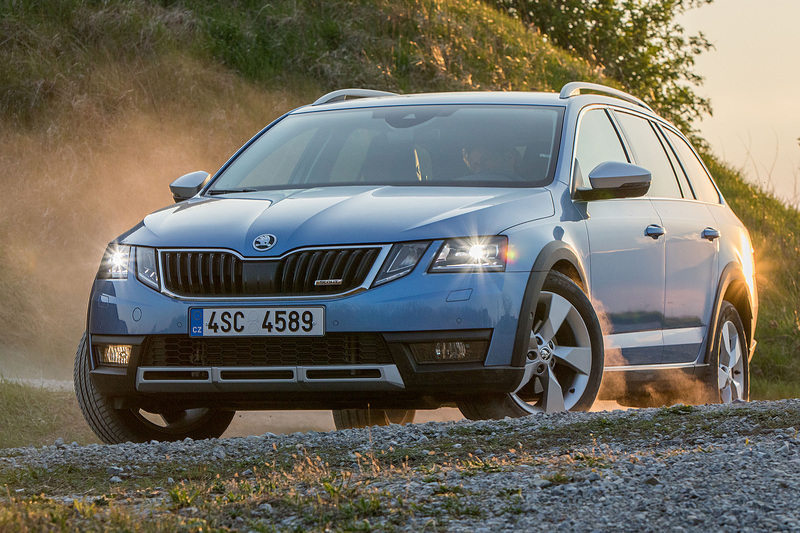 The wider, dynamic radiator grille is enhanced by additional full-LED headlights with Adaptive Frontlight System. 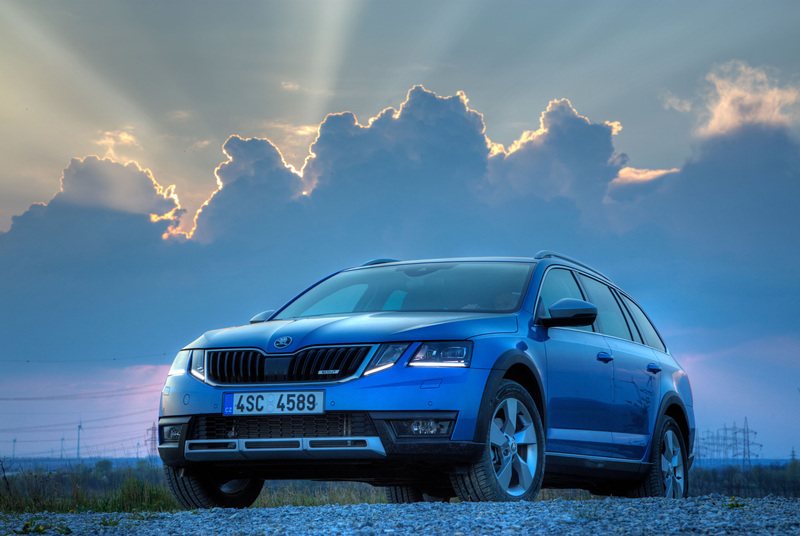 The crystalline look of the lighting units, which incorporates and reflects elements of Bohemian crystal glass art, is typical of the modern ŠKODA Design. The outer headlights produce the dipped beam. 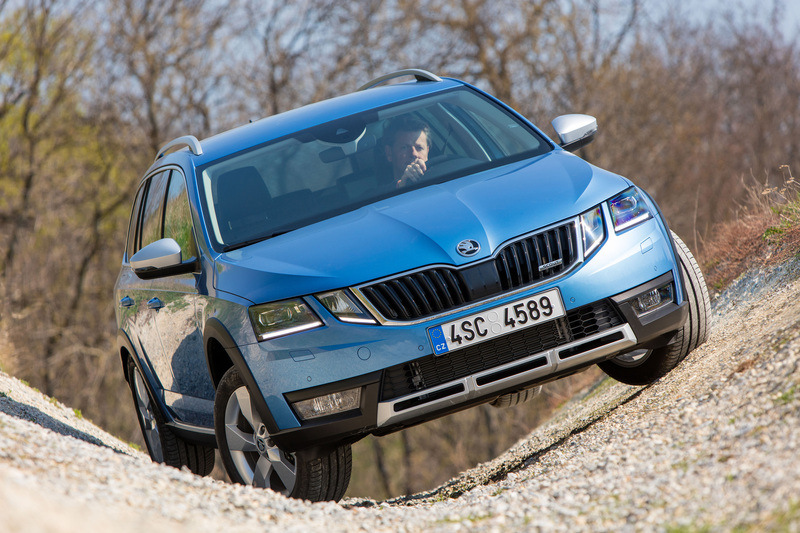 The inner lighting units, tapered towards the grille, produce the high beam. The headlights create individually configured light beams for country roads, motorways, urban traffic and rain. The bottom edge of the headlights contains a lighting unit that provides the indicators and daytime running lights. Using the front camera, Light Assist detects oncoming vehicles or illuminated urban streets and – if necessary – dips the beam automatically. The fog lights, which sit in the wide lower air intake, also feature LED technology and can be combined with the cornering function as an option. The visual combination of the radiator grille and lighting units creates a graphic entity which is typical for the new look and also ensures high recognition value. The outer air inlets have powerful contours; the lower section is filled with inserts featuring a honeycomb lattice design. The bumpers also have a clear horizontal orientation. The bonnet and wings have a clear and striking design; the brand logo above the radiator grille and on the tailgate has been further refined. 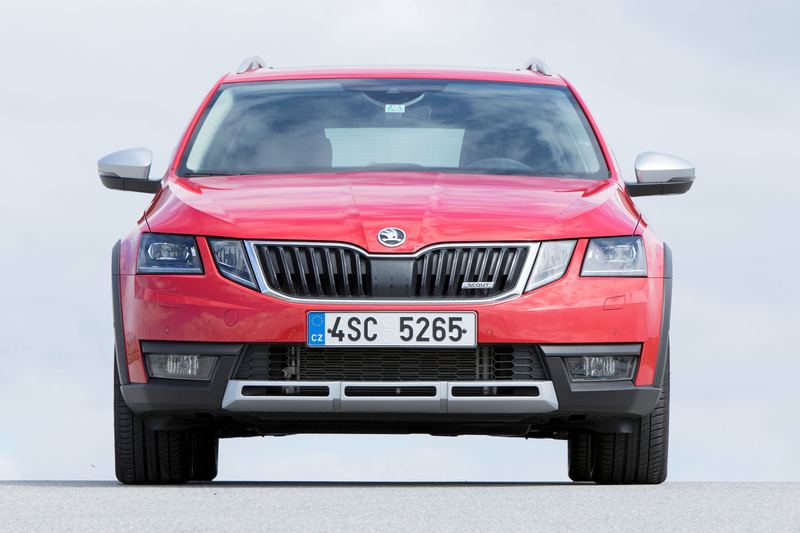 The horizontal design of the front section emphasises the robust character of the ŠKODA OCTAVIA SCOUT, as do the black ends of the underbody protection and the elements on the wheel arches and sills, which are also black. 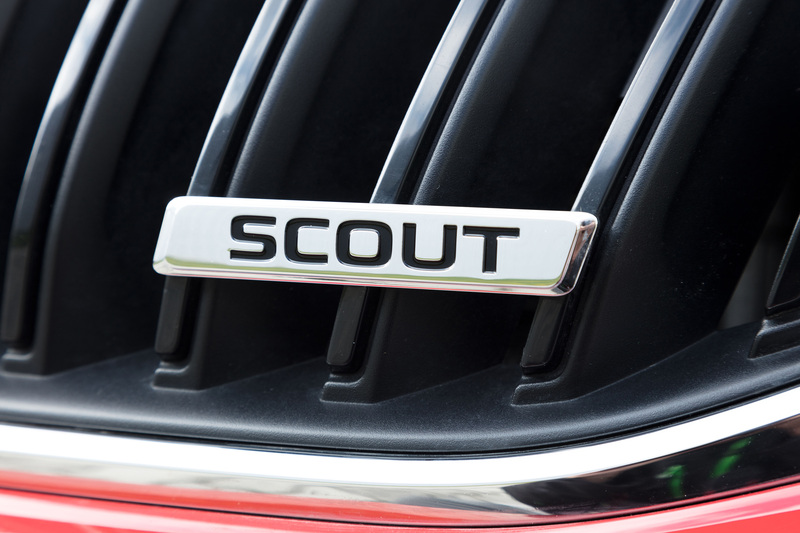 The sides and rear of the ŠKODA OCTAVIA SCOUT are characterised by precise, sharply cut lines that create a powerful interplay between light and shade on the surfaces. The rear section appears powerful and bold thanks to its subtle contours. The tail lights and number plate illumination feature LED technology. The C-shaped tail lights that appear as a homogeneous lighting surface are typical of the brand. A break separates the lines in the upper corner and makes the design even more striking. Contours in the lights, which improve the flow separation, ensure better aerodynamics. 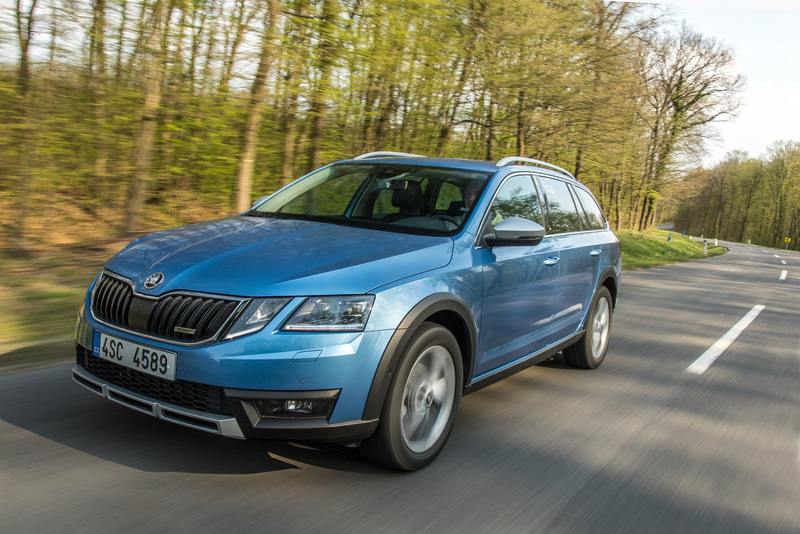 The ŠKODA OCTAVIA SCOUT is available in 13 body colours, including the new metallic shade Maple Brown. 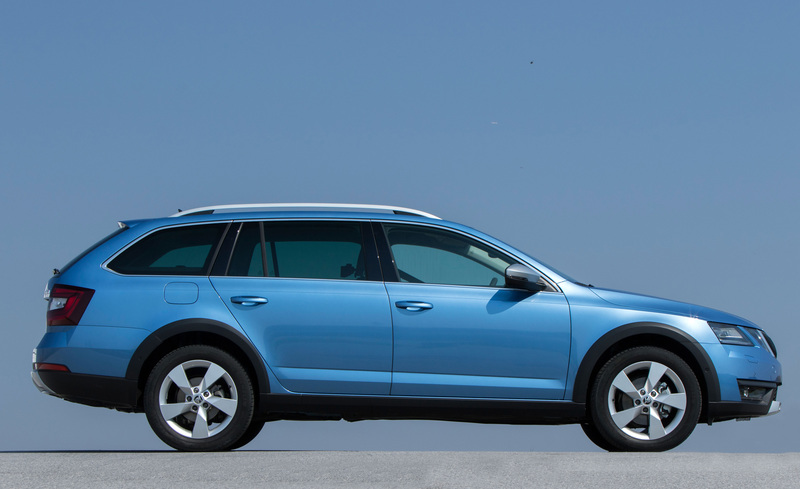 The external dimensions of the ŠKODA OCTAVIA SCOUT have changed only slightly from those of its predecessor. The length has grown by 2 mm to 4,687 mm; however, the rear track has been increased by 30 mm to 1,539 mm. The wheelbase of 2,680 mm, which is unusually large for this vehicle segment, has allowed an interior to be created that is one of the largest amongst its competitors. 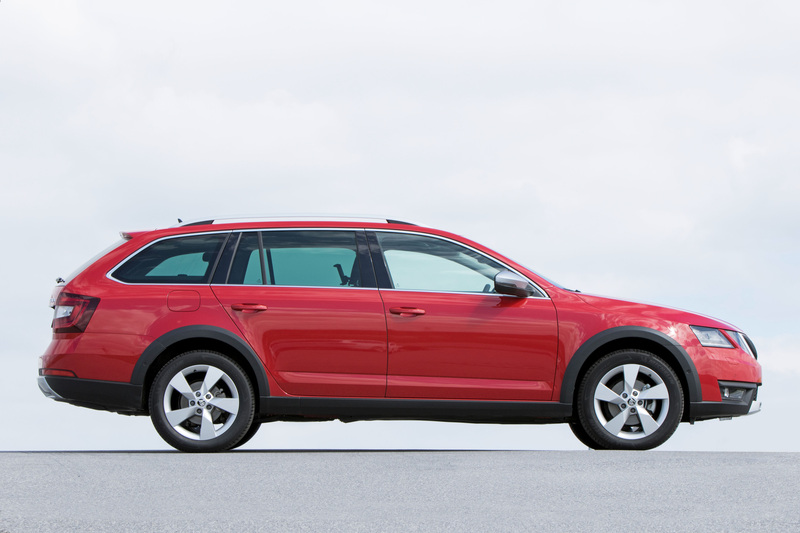 Occupants in the front and rear seats enjoy generous leg-, elbow and headroom. 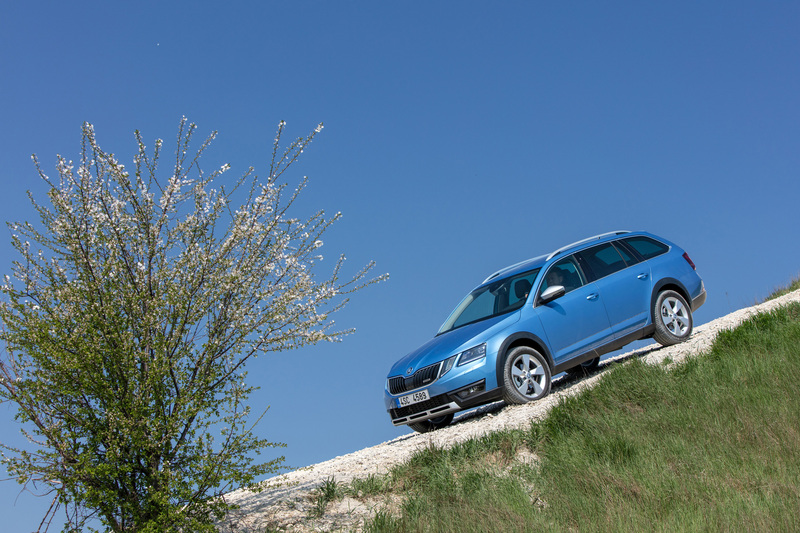 Besides the generous dimensions, excellent layout, high-quality materials and numerous new interior features, the ŠKODA OCTAVIA SCOUT also impresses thanks to its raised seat position, which guarantees a good view. The height and width of the interior are further emphasised by the horizontal design approach. The design of the large and easy-to-read round instruments has been revised, making them even more crisp. Numerous storage solutions in the interior increase its practicality. 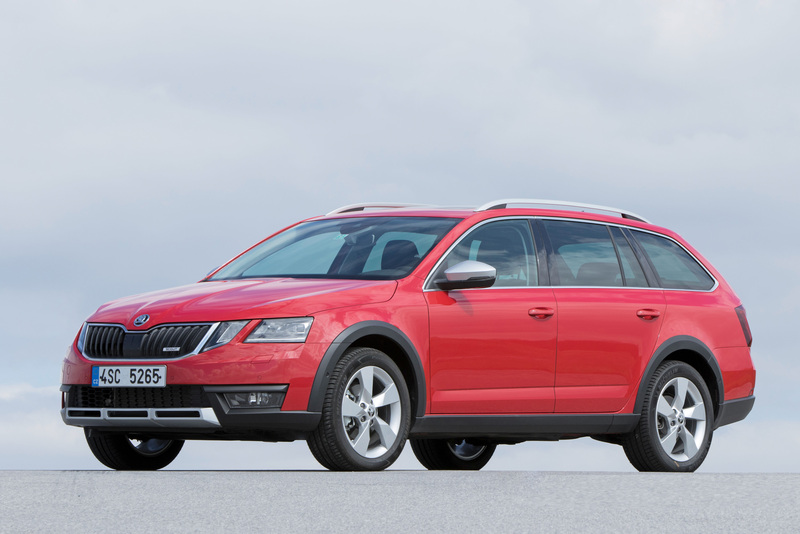 Comfort in the ŠKODA OCTAVIA SCOUT has also been further improved with, for example, the heated three-spoke leather steering wheel with multifunctional buttons, the illumination of the front and rear interior door handles and the LED ambient lighting in the decorative door trims, which can be set to one of ten colours. 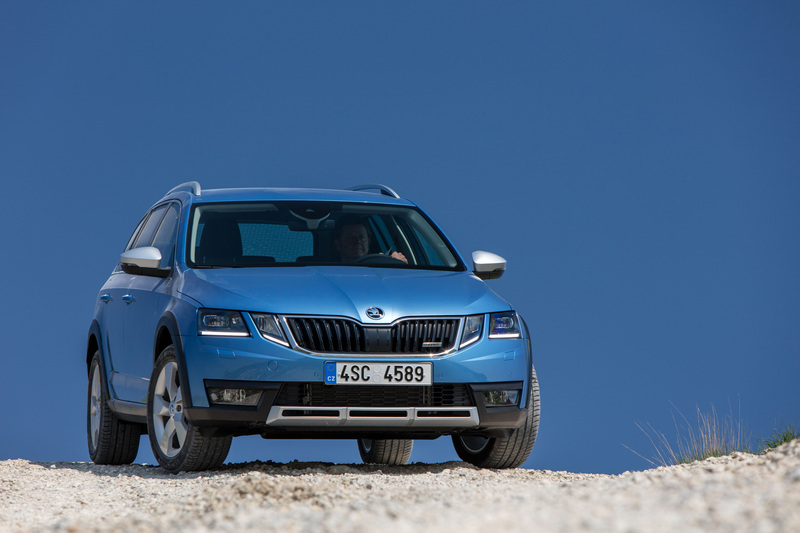 Other standard comfort features include heated washer jets, heated front seats and special seat covers with Thermo-Flux technology, which are particularly breathable and have double the level of air and moisture permeability of conventional seat covers. The comfort specification is complemented by the standard cruise control with a Speedlimiter function and the electrically operated front and rear side windows. 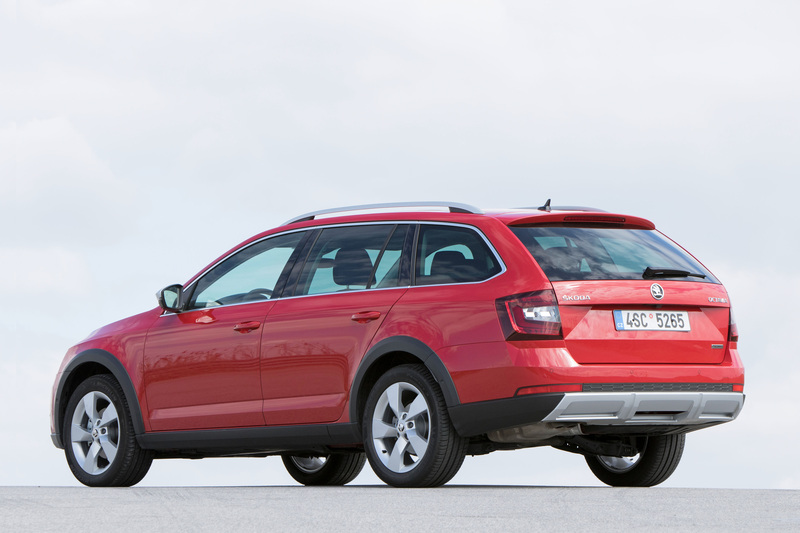 The generously sized boot has a volume of 610 l, which can be increased to 1,740 l with the rear seats folded down. Even bulky items can be transported with ease thanks to the 1,010-mm-wide opening. 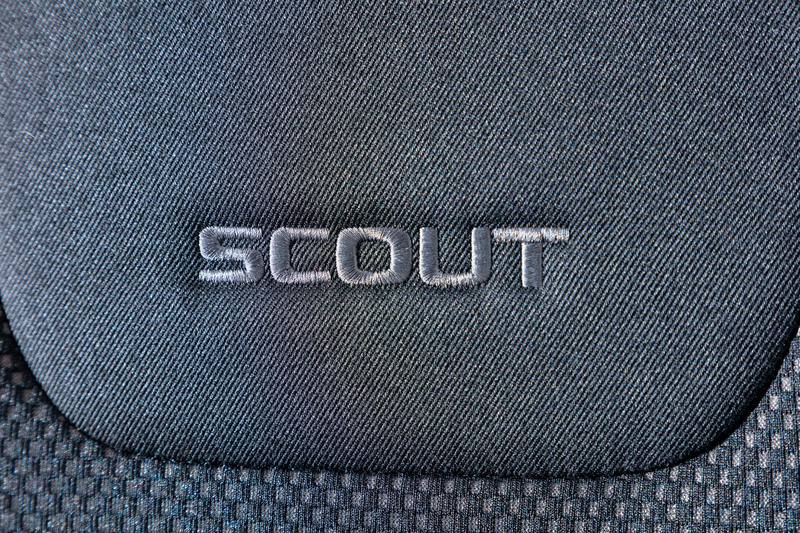 The door sills bear the Scout lettering. 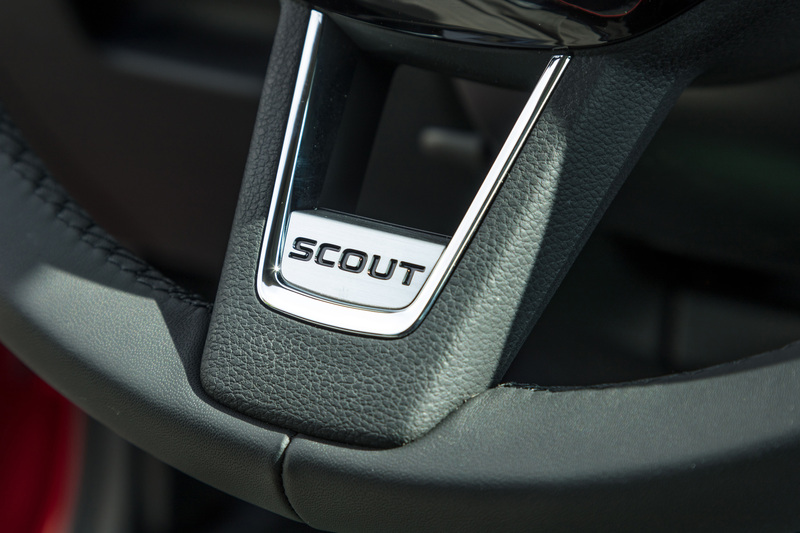 The Scout logo is stitched onto the seats, as well as onto the leather steering wheel and the gearstick knob. 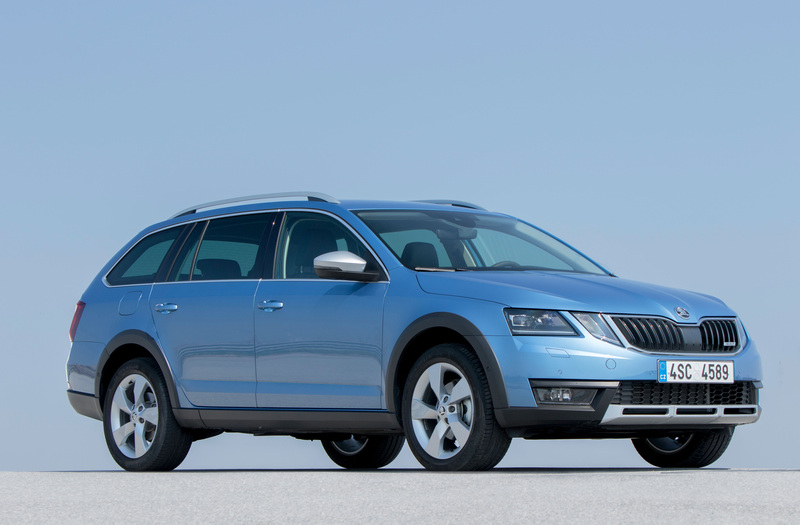 The car comes with a choice of three extremely efficient engines, all of which meet the EU6 emission standards. 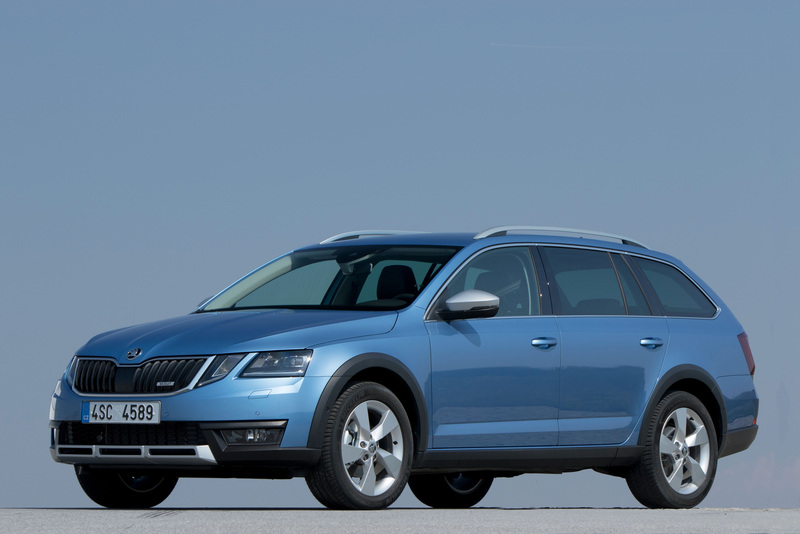 The petrol engine used in the ŠKODA OCTAVIA SCOUT is a turbocharged, direct-injection TSI engine with four cylinders. 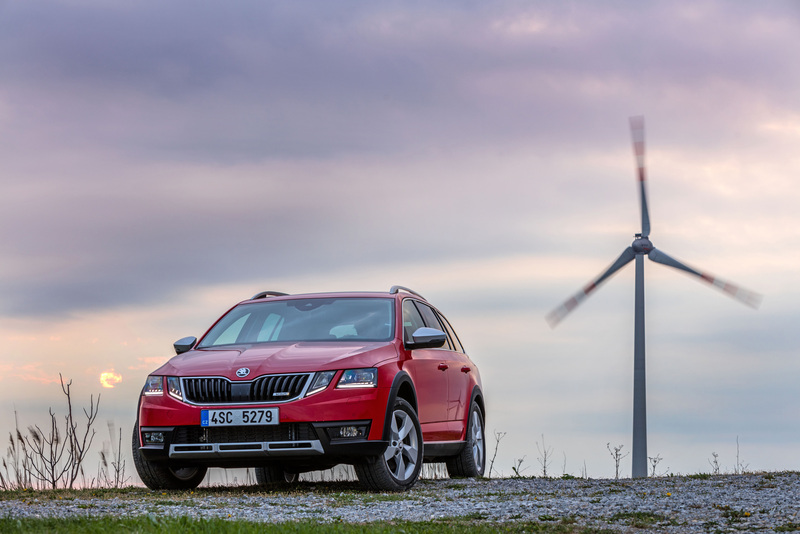 The powerful 1.8 TSI produces 132 kW (180 PS), offers a maximum torque of 280 Nm and is coupled with a 6-speed DSG transmission as standard, enabling the ŠKODA OCTAVIA SCOUT to accelerate from 0 to 100 km/h in 7.8 seconds and reach a top speed of 216 km/h. Maximum torque of 280 Nm is achieved between 1,350 and 4,500 rpm. 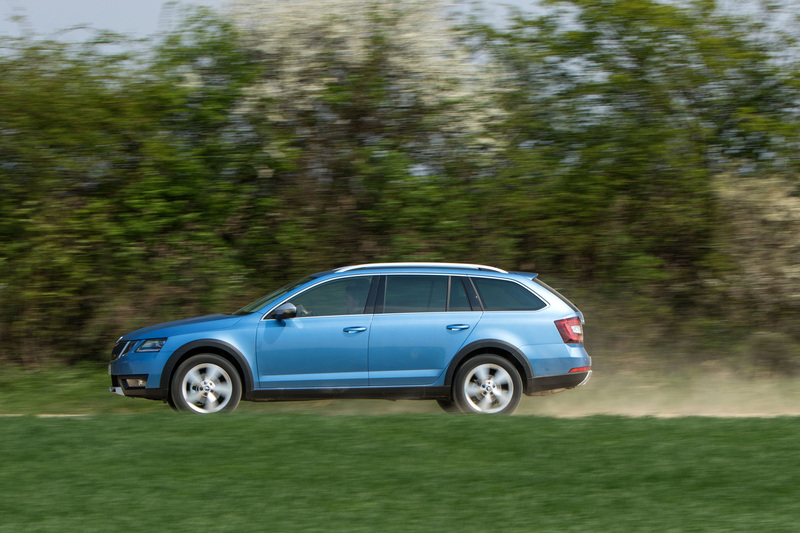 Average fuel consumption per 100 km is 6.8 l.
The 2.0-l diesel is available in two different power variants. Both are turbocharged, direct-injection TDIs with four-cylinders as well as four-valve technology, and impress with distinct smooth running and powerful torque. The variant that produces 110 kW (150 PS) is available with either a 6-speed manual transmission or the newly developed 7-speed DSG. 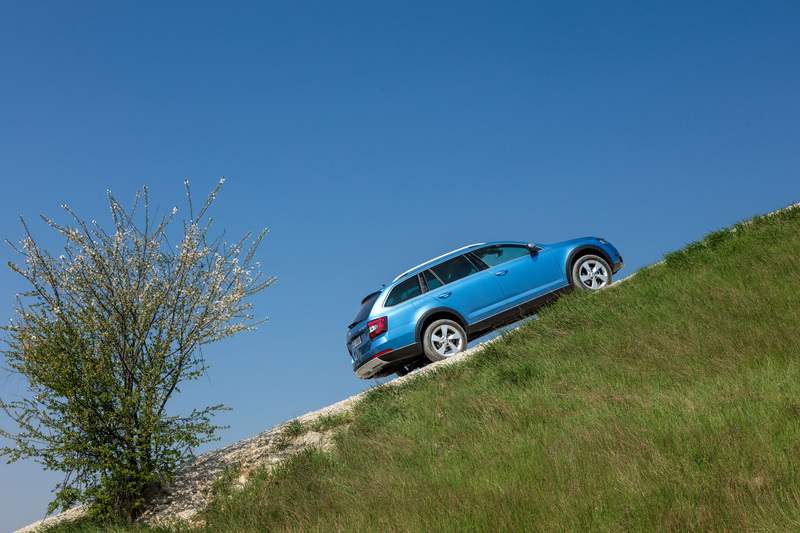 The manual version of the ŠKODA OCTAVIA SCOUT accelerates from 0 to 100 km/h in 9.1 seconds and its top speed is 207 km/h. Maximum torque of 340 Nm is achieved between 1,750 and 3,000 rpm. 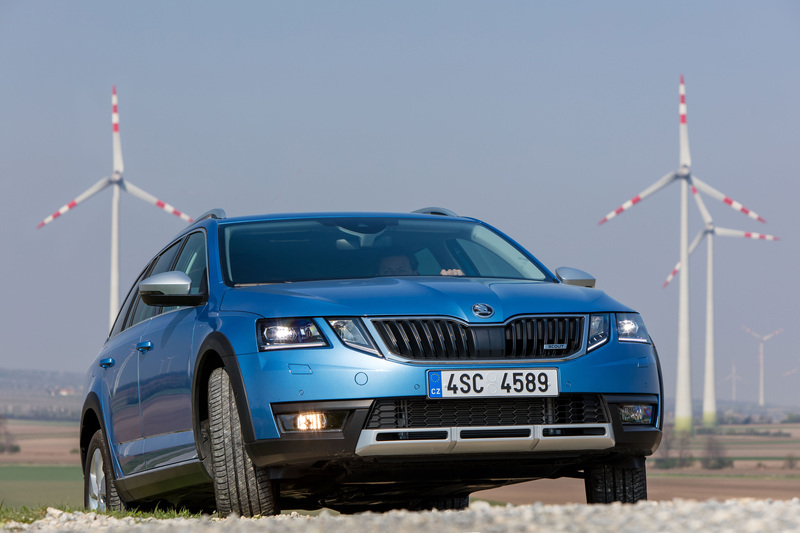 Average fuel consumption is about 5.0 l.
The top-of-the-range diesel engine fitted with a 6-speed DSG transmission as standard delivers 135 kW (184 PS), meaning that the ŠKODA OCTAVIA SCOUT can accelerate from 0 to 100 km/h in 7.8 seconds and has a top speed of 219 km/h. Maximum torque of 380 Nm is achieved between 1,750 and 3,250 rpm, whilst average fuel consumption is about 5.1 l per 100 km. 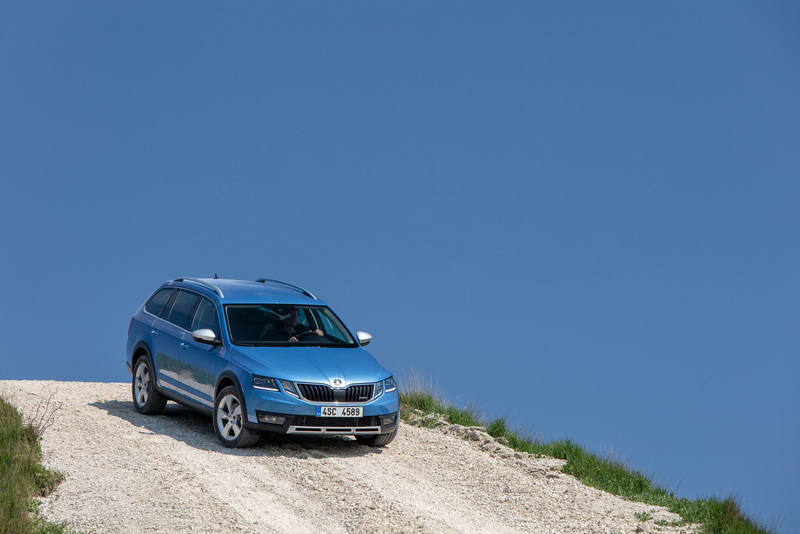 The ŠKODA OCTAVIA SCOUT comes with all-wheel drive as standard, which provides a critical increase in traction and safety. The central component of the system is a hydraulic multi-plate clutch with electronic control, which is positioned in front of the rear axle and stands out due to its compact design as well as its low weight. 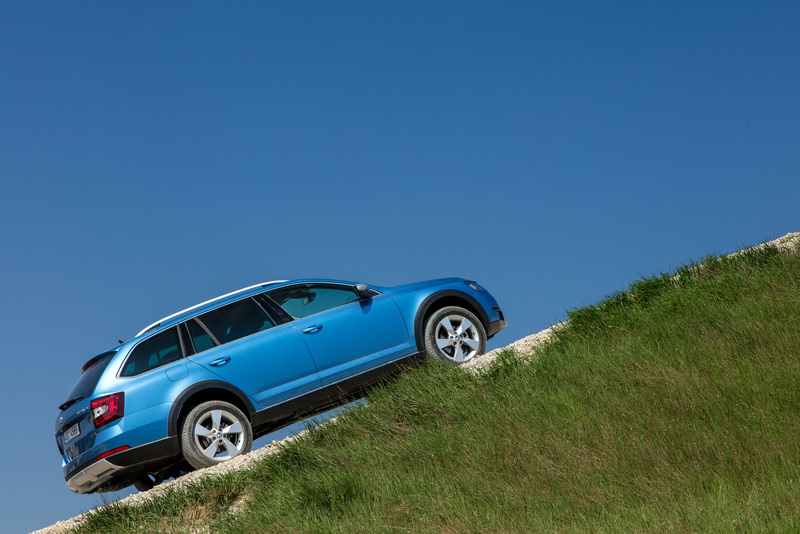 The torque distribution to all four wheels always depends on the driving situation with a control unit constantly calculating the ideal amount of driving torque for the rear axle. 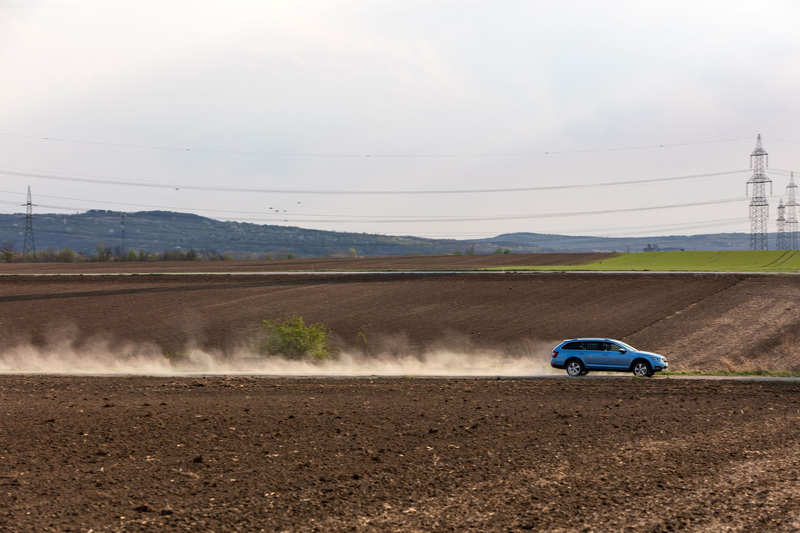 In addition, the front and rear axles are equipped with the XDS+ electronic differential lock, that ensures pulling away is easy on any surface and that the handling is even safer when cornering quickly. XDS+ does this by gently slowing down the inner wheels to transmit more power to the outer wheels, thereby guaranteeing increased agility when cornering. 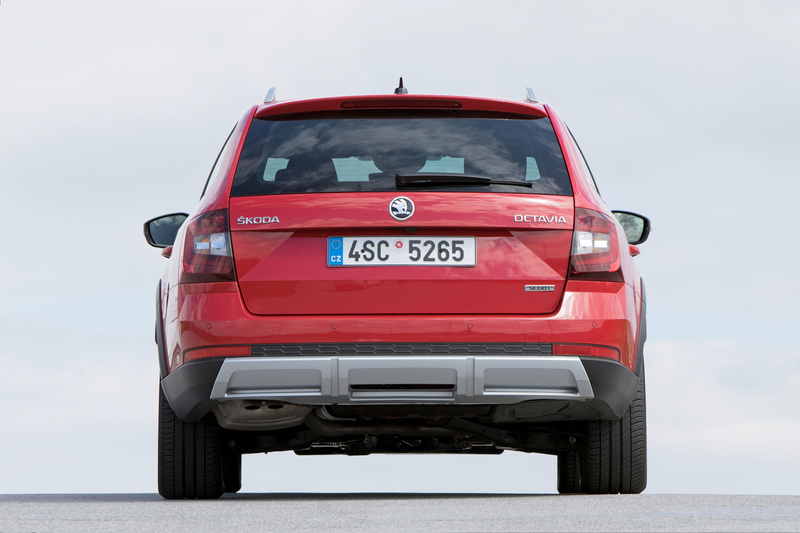 The multi-link rear axle distinguishes itself by providing a high level of comfort and good handling. The consistent separation of longitudinal and transverse stiffness is a fundamental design principle. The rear track has been widened by 30 mm and is now 1,539 mm. On the front axle, a MacPherson design with lower triangular wishbones is used. The use of high-strength steel for the wishbone and an innovative bionic design for the pivot bearing saves on weight. The centrally positioned front axle subframe is designed to maximise transverse stiffness. Besides the front axle components, the frame also includes the steering and parts of the engine mount. The rack-and-pinion steering has an efficient electro-mechanical servo drive and the large brakes ensure superior deceleration. 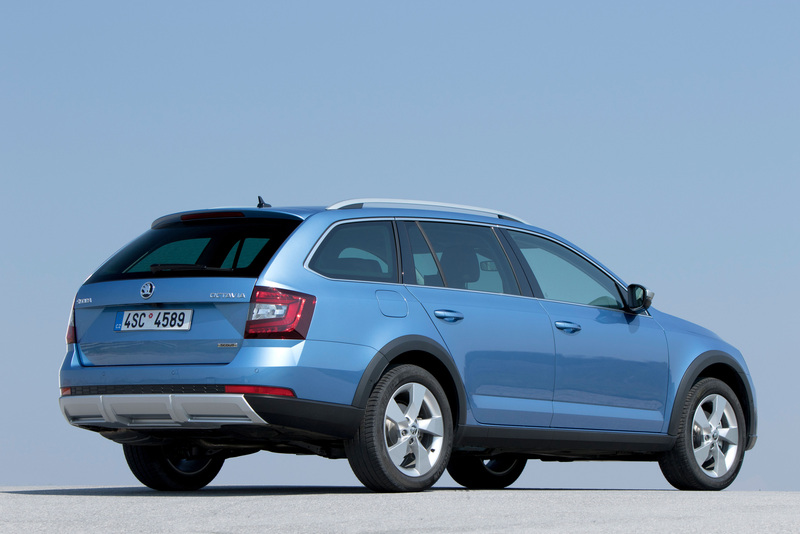 The ŠKODA OCTAVIA SCOUT also offers numerous ‘Simply Clever’ features, typical of the brand. For example, new additions include the bottle holder in the centre console, that allows PET bottles to be opened with one hand, and the removable LED torch in the boot whose battery recharges automatically while driving. Additional features that have been specifically developed for the Combi are the adjustable false boot floor, the multifunctional shelf under the boot cover, the boot barrier net, four bag hooks, two boot lights and a 12-volt socket in the boot. 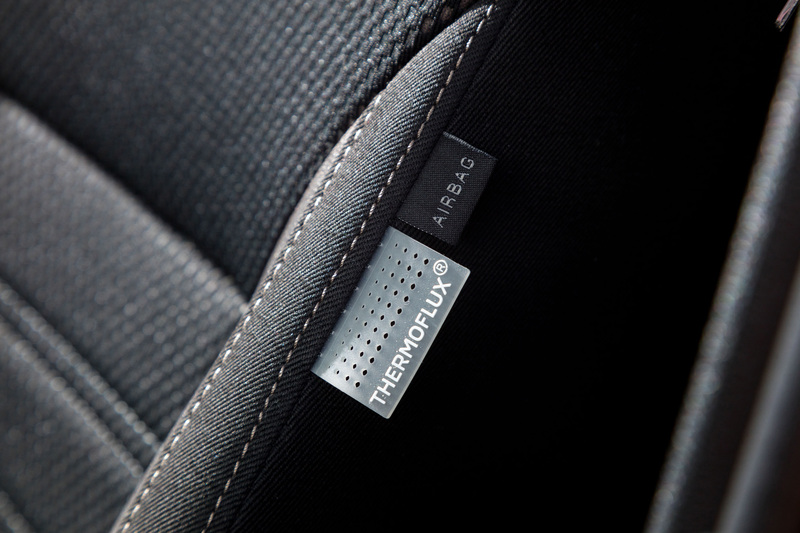 Alongside the personalisable keys, which can save individual settings for up to three people, the portfolio of ‘Simply Clever’ features also includes a heated steering wheel, two USB ports in the rear and folding tray tables on the backs of the front seats. 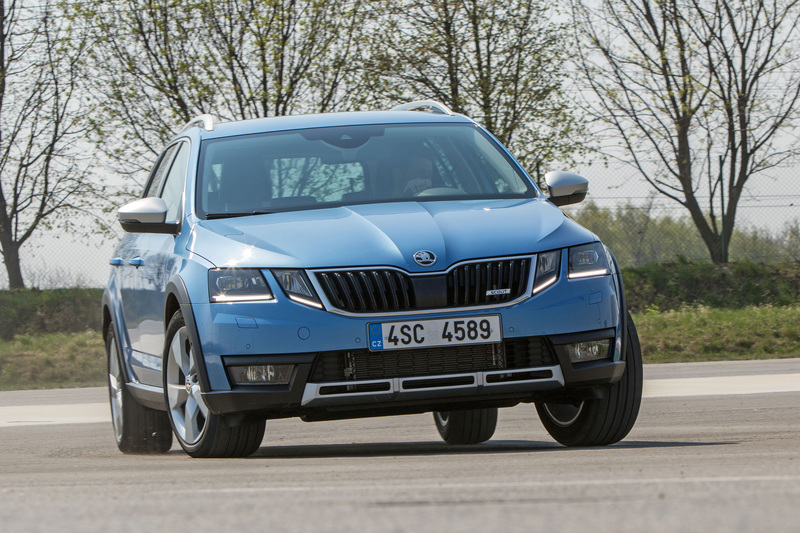 The new driver assistance systems in the revised ŠKODA OCTAVIA SCOUT provide increased safety and their functionality and scope exceeds the usual offering in this vehicle segment. 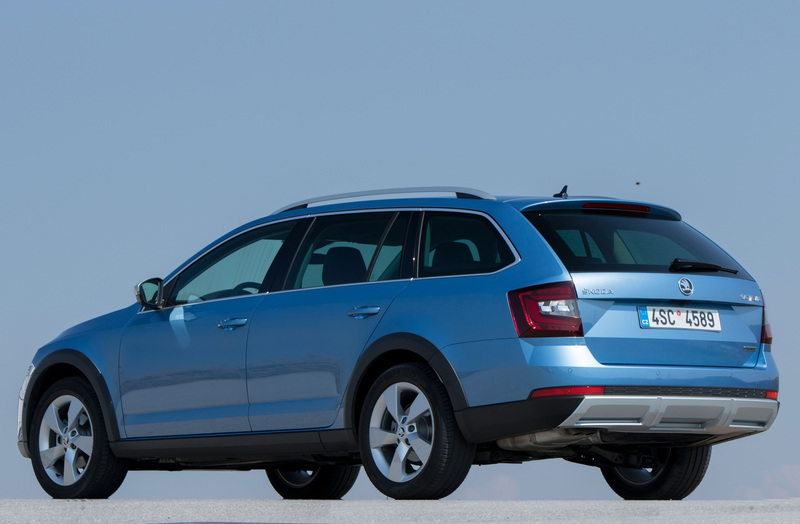 Front Assist with City Emergency Brake function has been enhanced with the Predictive Pedestrian Protection function. The system increases safety in urban traffic by performing an emergency stop at speeds between 10 and 60 km/h if a pedestrian dangerously attempts to cross the path of the car. 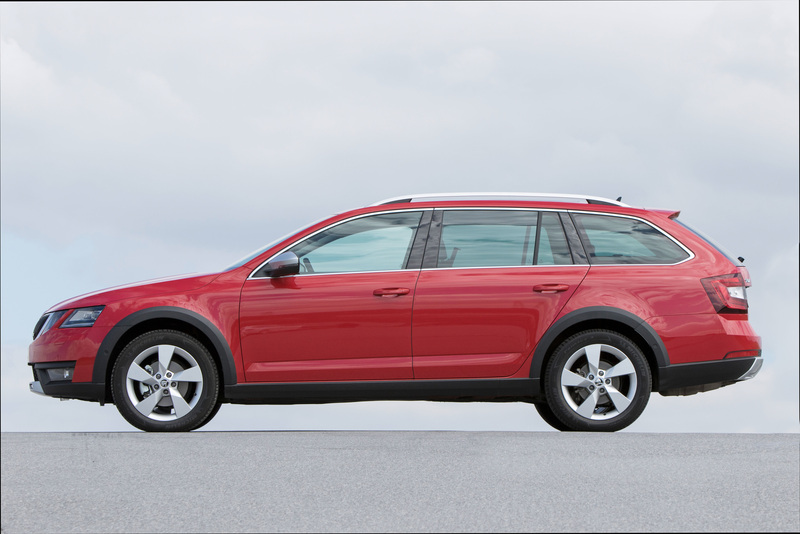 Front Assist, including City Emergency Brake and Predictive Pedestrian Protection, works together with Crew Protect Assist, which closes the windows and sunroof at lightning speed in the event of an impending accident and tensions the seat belts for the driver and passengers. Blind Spot Detect, which makes changing lanes safer, is another new feature. 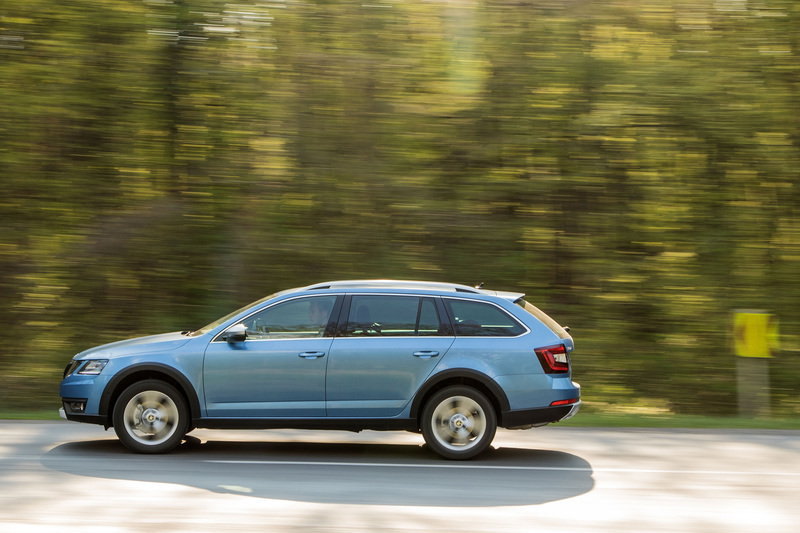 Thanks to two radar sensors at the rear, Blind Spot Detect can detect vehicles that are approaching rapidly from the rear or that are already in the blind spot. The system then warns the driver with an LED light in the housing of the corresponding wing mirror. If the driver uses the indicator anyway, the LED flashes several times at short intervals. The Rear Traffic Alert system, which monitors and safeguards when reversing out of parking spaces or driveways, is also newly available. 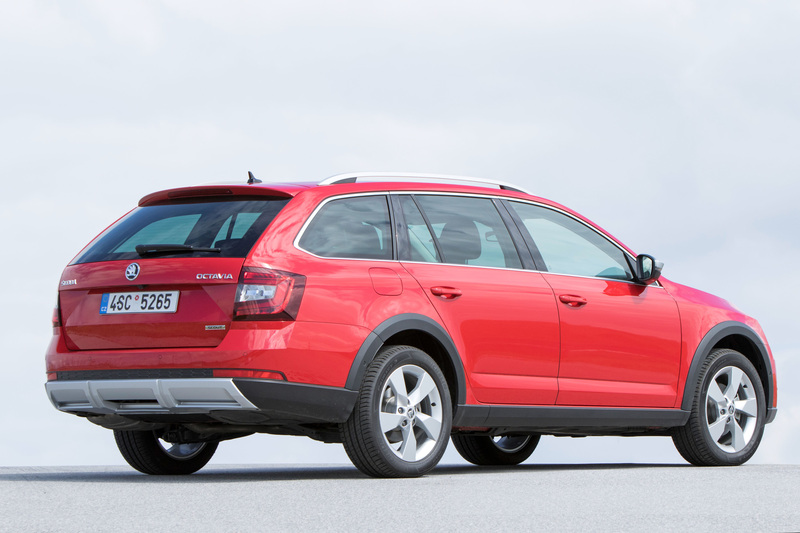 Rear Traffic Alert detects cars that are crossing the space or the driveway, warns the driver first visually, then acoustically, and eventually initiates braking if necessary. The information for the system is provided by Blind Spot Detect’s tailgate radar sensors. Manoeuvring cars and trailers is not to everyone’s taste. 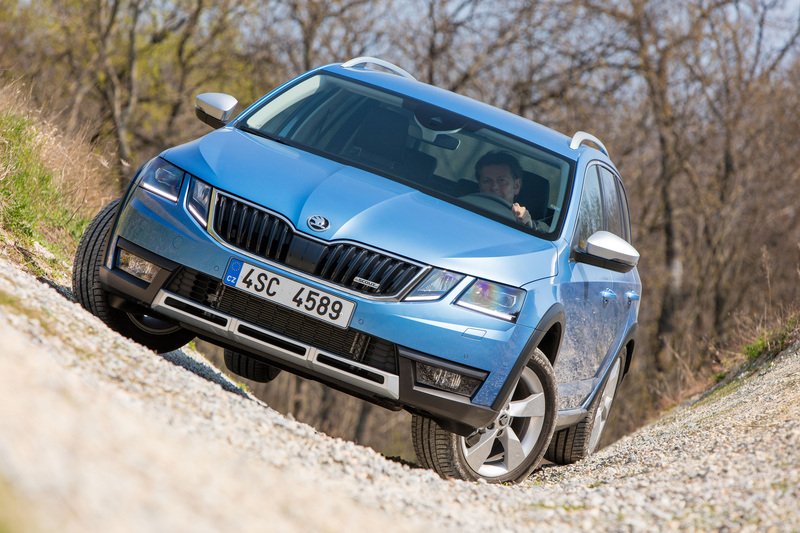 The new Trailer Assist feature in the ŠKODA OCTAVIA SCOUT is a real help when doing this. Trailer Assist makes reverse manoeuvres with a trailer into an easy exercise. In order to do so, the driver first sets the angle they would like to use for reversing using the wing mirrors’ turn-switch. Subsequently, the driver only has to accelerate gently. The system does the rest: it adjusts the steering wheel to the chosen course and manoeuvres the trailer safely into the intended space or position. If the angle between the vehicle and the trailer becomes too large, a warning signal is emitted. In critical situations, the system slows the trailer down automatically. As the name suggests, Manoeuvre Assist, which is also new, provides help when performing tricky manoeuvres without a trailer. 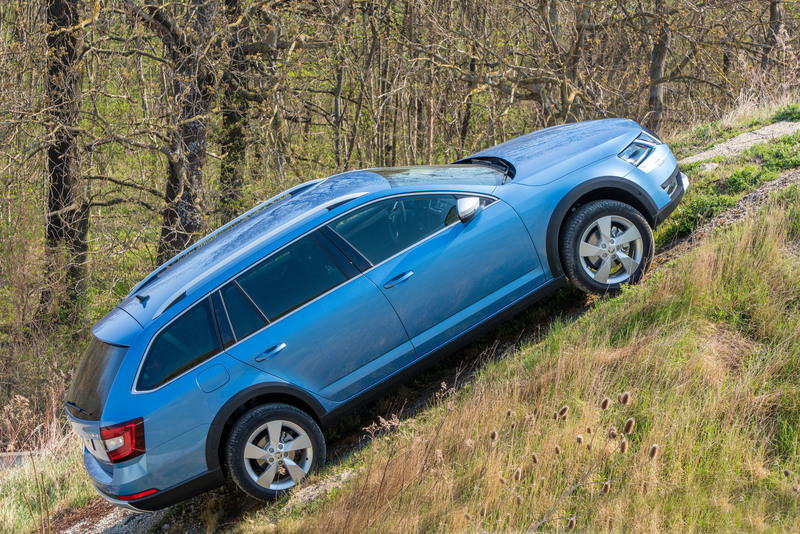 This system applies the vehicle’s brakes as soon as it detects an obstacle behind or in front of the vehicle. Manoeuvre Assist and Trailer Assist use the improved functionality of the ultrasonic parking sensors for their interventions. 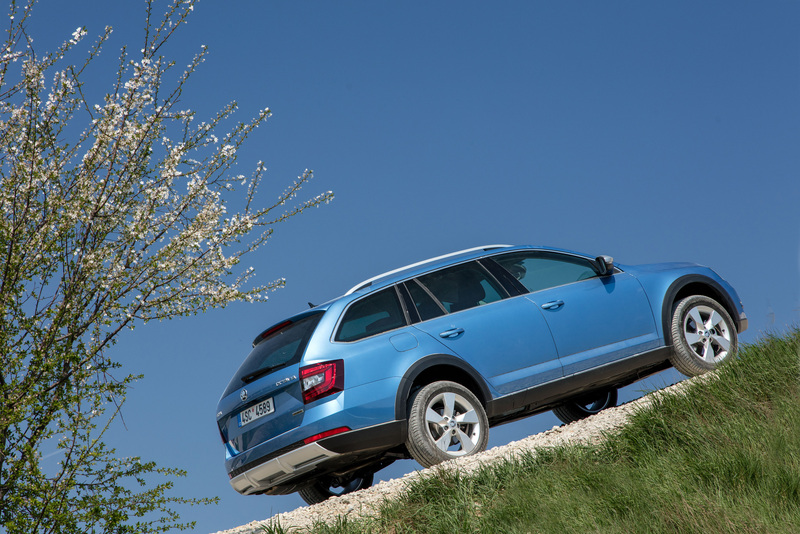 Furthermore, the ŠKODA OCTAVIA SCOUT features numerous proven assistance systems. Adaptive Cruise Control (ACC) helps the driver to maintain the desired gap from the vehicle in front at a preset speed. 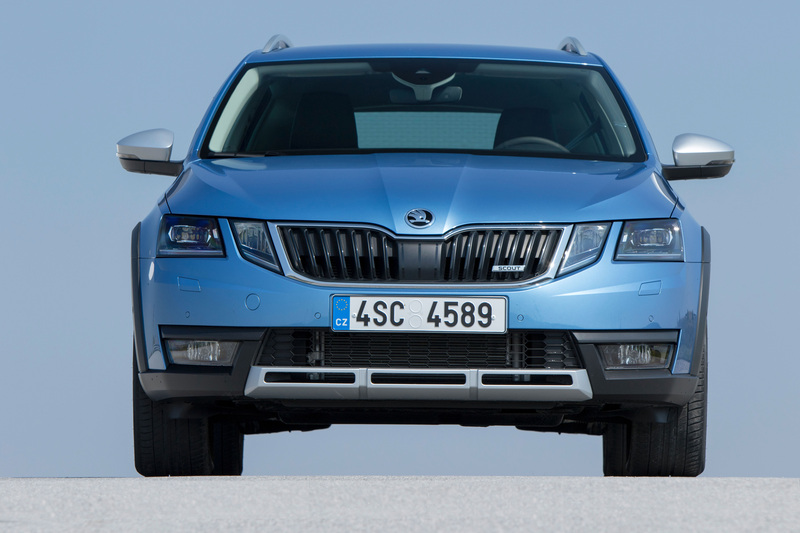 The newly developed radar sensor, integrated within the radiator grille, now works at speeds of up to 210 km/h. 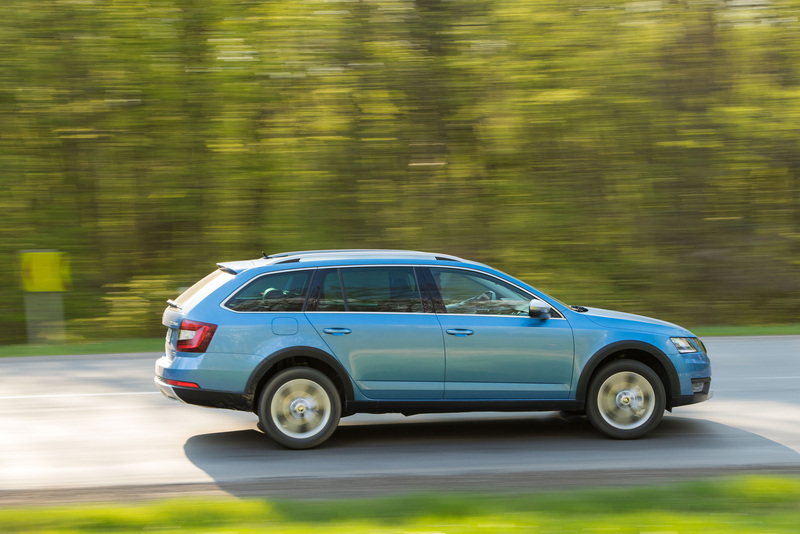 Lane Assist helps the driver to stay in lane by gently adjusting the steering where necessary. The fatigue detection system recognises a reduction in the driver’s concentration and prompts them to take a break. Travel Assist with Traffic Sign Recognition displays speed limits and other roads signs on the in-car computer or on the navigation screen. 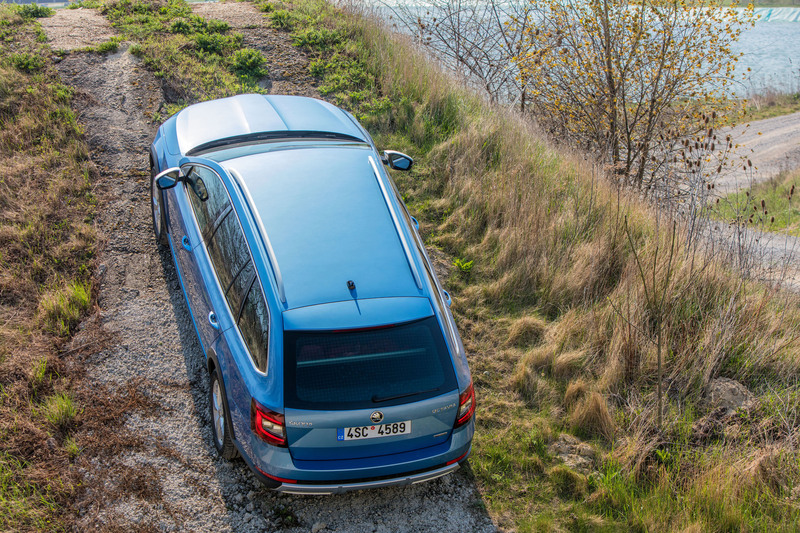 Park Assist autonomously steers the vehicle into parking spaces and if necessary, can also take over when manoeuvring out of parallel parking spaces. Light Assist automatically regulates the high beam. 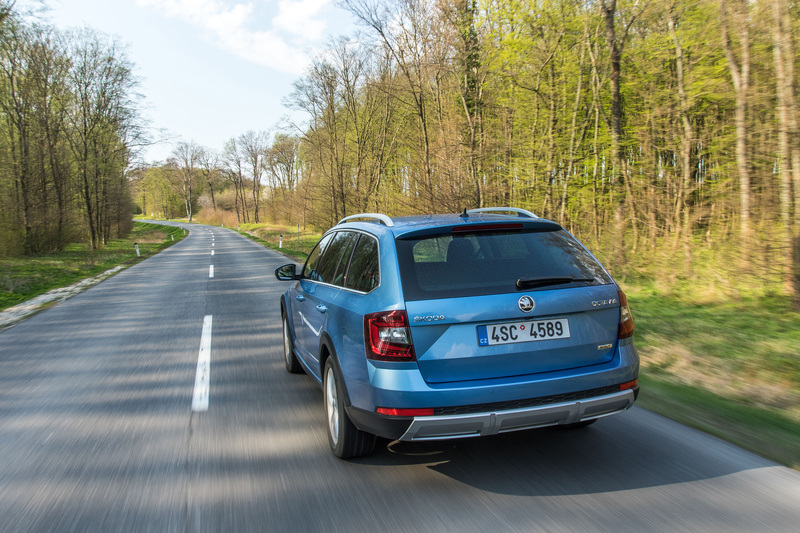 The level of passive safety in the ŠKODA OCTAVIA SCOUT is still very high. Up to nine airbags, including a knee airbag for the driver as standard, are part of the equipment that makes this happen. Child seats can be secured using Isofix, as well as top tether anchor points. The tyre pressure monitor completes the package. 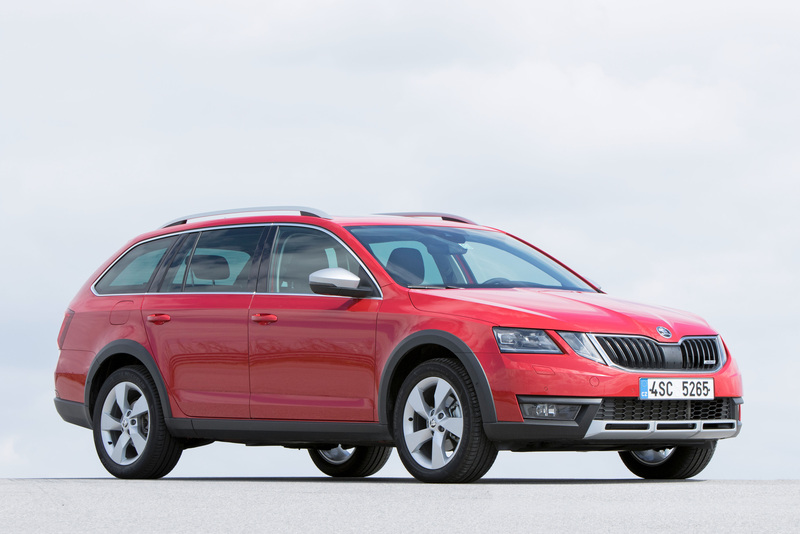 The latest generation of infotainment systems is available for the ŠKODA OCTAVIA SCOUT. Their capacitive touch displays come in a glass design. 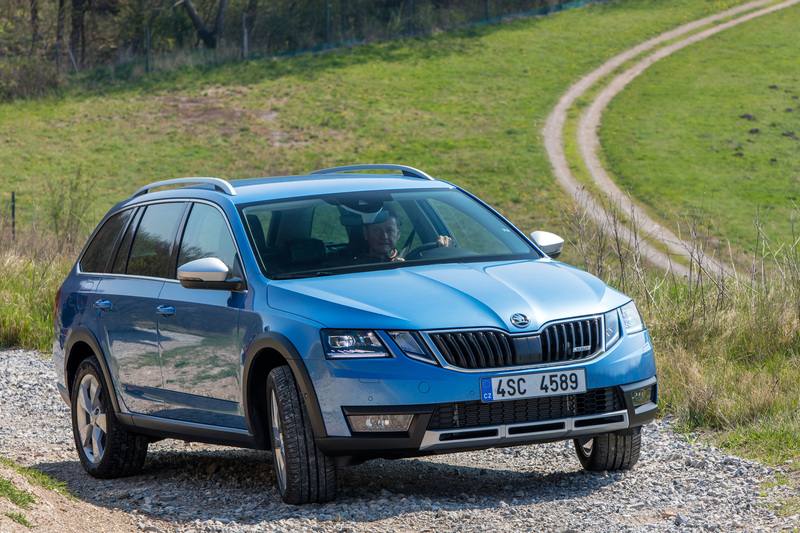 The top-of-the-range version is the Columbus navigation system, which comes with a 9.2-inch screen, a Wi-Fi hotspot and an optional LTE module that allows occupants to be ‘always online’. 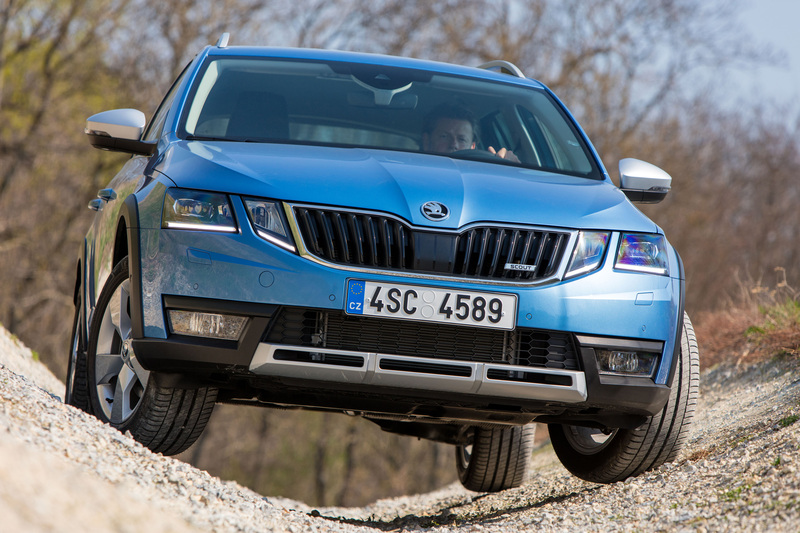 The new mobile online services from ŠKODA Connect are divided into two categories: the Infotainment Online services providing information and entertainment, and the Care Connect services providing assistance and remote access to the vehicle. 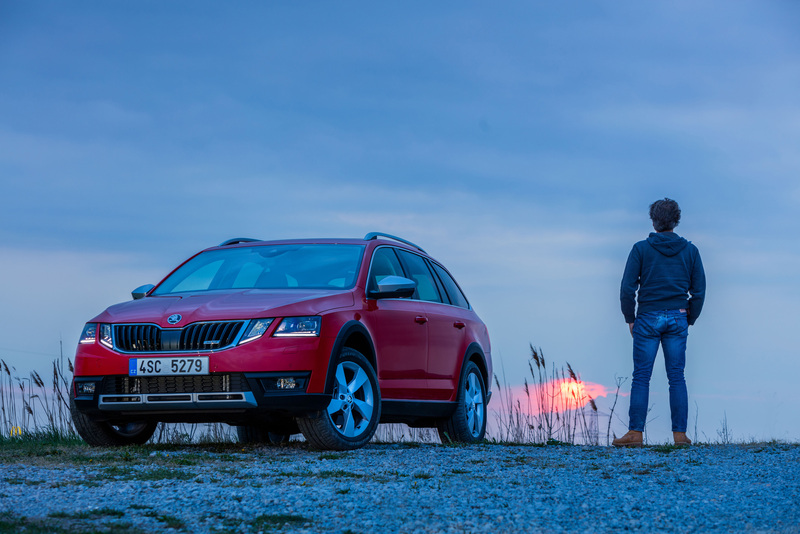 Via the new ŠKODA Connect portal, these services can also be accessed from the customer’s home computer. The driver can configure various services as well as transfer destinations, routes and points of interest (POI) to the car. The data for the Care Connect services is transferred via a SIM card with high-speed LTE that is already installed in the vehicle. Online Traffic Information displays the current traffic flow on the chosen route and suggests suitable alternatives in the event of a traffic jam. The services provide further helpful information on petrol stations, parking spaces, news and the weather. Additional services are exclusively available for the Columbus system: Google Earth™ integrates the navigation route into the interactive world map with its photo-realistic map views. The Online Map Update service provides the customer with new maps at regular intervals. Using Online POI-Search (Voice), the driver can use voice control to search for locations that interest them. 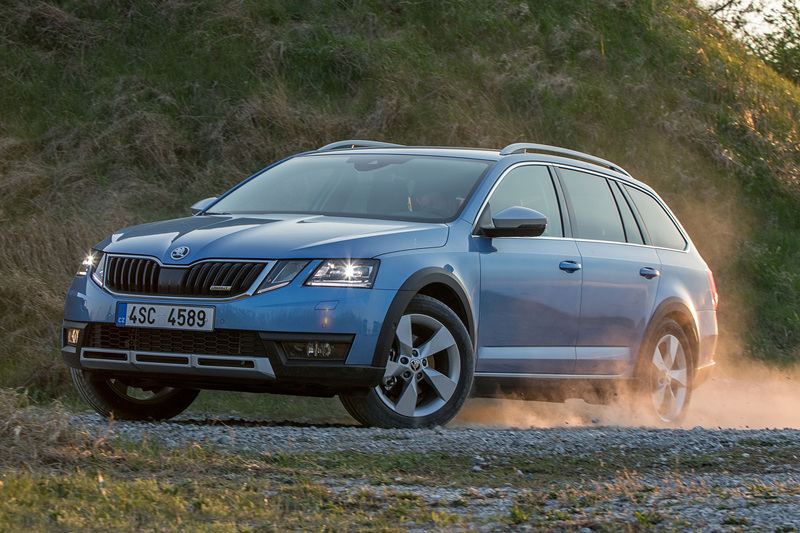 Emergency Call features as standard in the upgraded ŠKODA OCTAVIA SCOUT. If a restraint system has been activated following an accident, the system establishes a voice and data connection to a dedicated emergency call centre and transfers all of the necessary information. An employee at the emergency call centre initiates the necessary support measures and, if required, sends an emergency vehicle to the site of the accident. The driver and passengers can also trigger the Emergency Call manually via a button in the roof module. 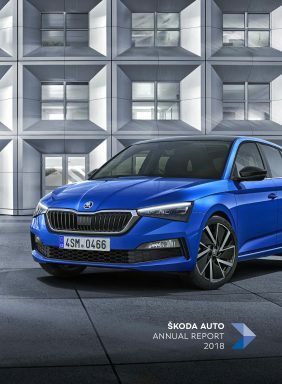 Other Care Connect services work using the new ŠKODA Connect app on a smartphone. The driver can access information about the vehicle’s condition on their smartphone or send their route planner to the car via the app. The new remote services allow the driver to remotely access information about the lights and doors, how much fuel is in the tank, and other information. The Parking Location function directs the driver to their car. The Honk & Flash function makes it even easier to find the car, by sounding the car’s horn and flashing its lights. Area Notification, the Online Anti-Theft Alarm and Speed Notification functions inform the owner if their car is used by a third party in a way which they have not permitted. The Route Statistics function rounds off the range of remote services. 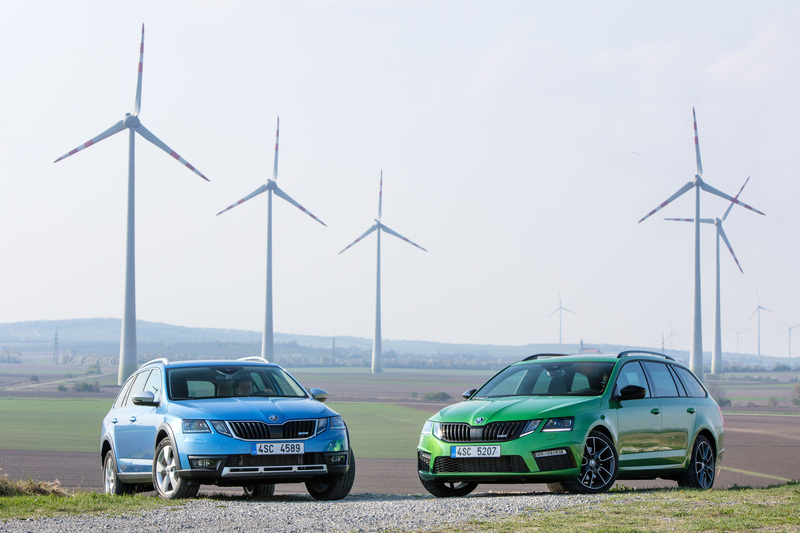 The SmartLink+ platform incorporates smartphone apps and brings Apple CarPlay, Android Auto and MirrorLinkTM into the ŠKODA OCTAVIA RS models. As soon as the customer connects their smartphone to the USB port, the relevant environment opens. The range of apps that can be integrated via SmartLink+ in variants which have been specially adapted for the vehicle is regularly updated. 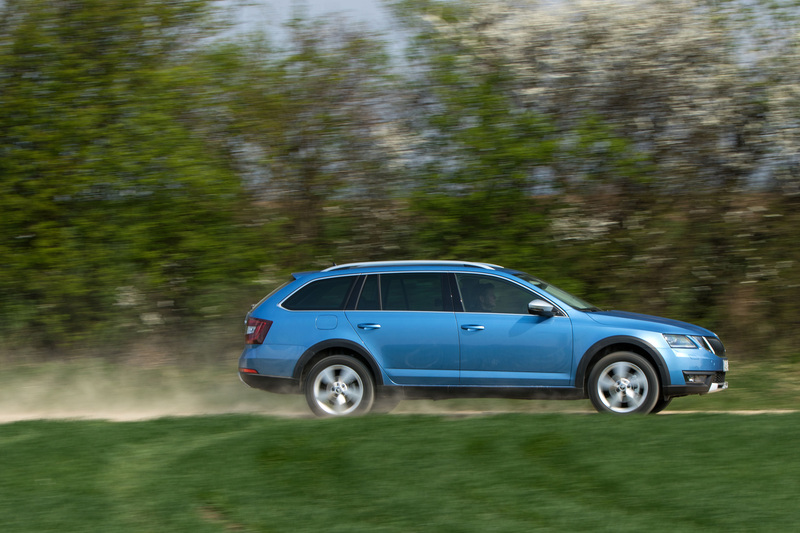 The availability of Android Auto and Apple CarPlay may vary depending on country.